The experiment I’m reporting on this week was HUGE for me. I sent out my Christmas cards in January. For more years than I can recall, creating, writing messages and mailing Christmas cards has been such a holy gig for me. It still IS. Years ago, my tradition was to have them in the mail the Monday after Thanksgiving. Then that shifted to mid- December. Then the week of Christmas Day. 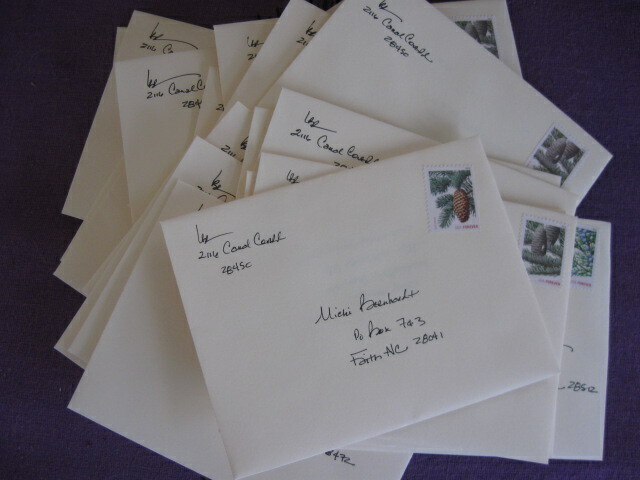 And this year, I enjoyed a New Years Day of writing (not as many as I have in years past) Christmas cards. For those of you who don’t know, my Episcopal roots are deep. I love that whole Church Year thing. So I get that, according to my faith traditions, it’s Christmas until Jan 6. So technically, I wasn’t LATE. Who cares if I was? I did hear from a few dear folk – wondering where their card was. I let them know it WOULD arrive. And it did. I’m a papermaker – a greeting card maker. So I CELEBRATE real paper cards sent through the mail. Things we can touch. Something with our handwriting and a stamp on it. Call me crazy – go ahead. Here’s what I learned in this experiment. The world didn’t end when my Christmas cards went out after Christmas Day. And next year they WILL be mailed before Christmas day. NOT because I feel pressured or guilty, but because I missed creating space to connect with people I love. I know a lot of people (not just Christians) struggle with the whole Christmas card thing. Please don’t hear/read me telling you what YOU need to do. I can just tell you that this experiment didn’t work for me. Great learning, Lisa! Thanks for sharing it with us. And I speak from experience that getting something in the mail from you is a blessing. Got my journal Saturday–thanks. Meant a lot. Thank you! I am still finishing mine. It was important to connect this year NOT be on time. Alicia, SO glad your journal arrived! Carrie, thrilled YOUR time schedule is working for you – YAY! Corrine, what a holy way you and your husband are choosing to connect. continuing to hold ya’ll in my heart. I love that line – means sending cards late, or never, or early and watching the world not collapse. it means, do the right thing, but at your own pace. it means, embellish it as well. I’m with Carol!!!! especially her last line. I would cherish a Christmas card from “FABULOUS YOU”. And I wouldn’t think of it as late, I would think of it as incredibly early! I’m still experimenting with the Christmas card thing. I started this year with the intention of doing handmade cards—took me about two hours to make two cards I was satisfied with, then found out the envelopes that were sold to me to match the card stock were too small! I then found some store-bought ones a few days before Christmas and intended to get those out by Jan. 6, but kids coming home made me forget all about them. I have been considering Valentine’s Day, too. Then again, my old Pagan British blood runs pretty strongly in my veins, so I’m thinking that maybe the Vernal Equinox (which is really my favorite time of year, so full of green growth!) might be the the time to choose. Of course, by then I’ll be dropping everything else to run out to the garden! Maybe I’ll experiment some more with mental telepathy….. I have these two opposing forces…both strong. On the one hand, I absolutely hate writing Christmas cards. Just plain work for me, and I’d rather not do it. On the other hand (opposing force here), I love staying in touch with people I love. And I love getting Christmas cards from all those people. So I always end up sending out Christmas cards. And yes, I still do a fair amount of agonizing over the whole thing. But it’s worth it. My Christmas cards (photo card of me and my kids on the day I graduated with my doc) are sitting beside me as I type. I will get them out some time soon….maybe for Ground Hog’s day!!! Like folks here, I love connecting with the people I send cards to. Most only hear from once a year and it means a lot to be to stay in touch. For many years, I sent out my cards in July. The first year I did, it was because I was incredibly late with sending out my Christmas cards. After that year, it became a tradition to send them in July. When life calmed down for me and I could return to sending them out in December, many folks were disappointed! Bottom line: I’m with everyone here… it’s the connection that matters, not the when! ML, Tom & Judi, the whole and holy timing thing does seem like a common thread. may we all BE and DO in our own time. THANKS… i am so honored by all of you.